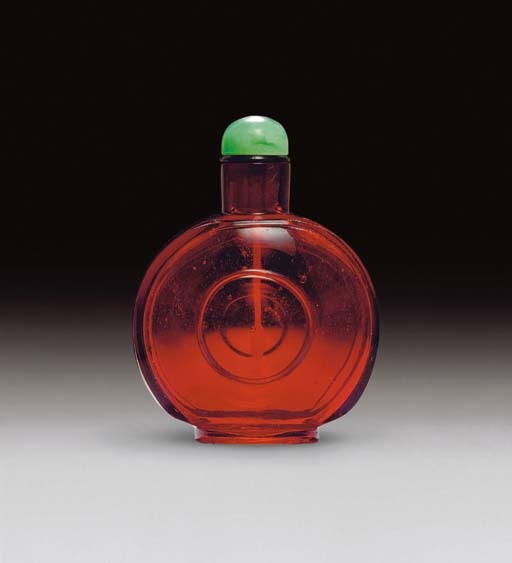 This bottle is an early example of a ruby-red bottle produced at the Palace Workshops. Its shape is extremely unusual, but incorporates the flat or dished central panel which seems to have acted as an integral snuff dish. See M. Hughes, The Blair Bequest. Chinese Snuff Bottles from the Princeton University Art Museum, p. 114, no. 128, for a very similar example, where another example is referred to by the author, sold at Sotheby's, Hong Kong, 3 November 1994, lot 825. Another in the Bloch collection is illustrated by Moss, Graham, Tsang, A Treasury of Chinese Snuff Bottles, Vol. 5, Glass, no. 789.